The Lhasa Apso comes from the country of Tibet. The name Lhasa comes from the holy city of Lhasa in Tibet, while “Apso” means “bearded” in the Tibetan language – thus the name simply means “long-haired Lhasa dog.” This breed of dog is one of the oldest recorded breeds in the world dating back to 800 B.C. For years Lhasas were used to guard the palaces and the Buddhist temples. They often guarded in conjunction with the massive Tibetan mastiff; the Lhasa provided the bark, while the mastiff provided the bite. Lhasas were considered sacred, and it was thought that when an owner died, the human soul entered the body of his Lhasa Apso. These little dogs were considered very lucky, and they were hard to come by. In fact, the only way outsiders were able to acquire a Lhasa was if the Dalai Lama gave them a pair. The 13th Dalai Lama gave a pair of Lhasa puppies as a gift to C. Suydam Cutting in 1933, and he introduced them to the United States. The Lhasa is highly independent, and they aim to please themselves, not necessarily you. They’re big dogs in a small dog’s body, and will be your leader if you allow them to; they like to be top dog. Because they were bred for hundreds of years to be watchdogs, Lhasas are loyal guardians of their home and family, and they can be fierce when protecting their own, though usually never aggressive. They can be happy, mischievous, and playful. The Lhasa matures slowly and remains in the puppy stage until they’re about three years old, so don’t expect too much too soon. However, this little dog is well worth your efforts in training them, as they’ll give you back loyalty, joy, and companionship. 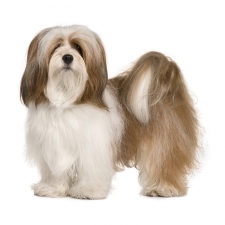 The Lhasa Apso usually weighs between 12 to 18 pounds and stands approximately 9 to 11 inches. They are a small dog with a stocky and sturdy build. Their hair is long and thick and comes in a variety of colors. The beautiful Lhasa coat needs a lot of grooming, so expect to do a lot of work or to take them to a professional groomer. Lhasas are known in their homeland as “Abso Seng Kye,” which translates as “Bark Lion Sentinel Dog.” They get their thick coat from living in their native land where the climate is one of intense cold and extreme heat. They snore – a lot! You’ll need to be a strong leader as this tiny breed will walk all over a weak owner.